Ms. Harrell began her teaching career at Children's Hospital of Alabama, teaching students who were hospitalized. She taught first grade at Oneonta Elementary before coming to Moody Middle School in 2001. 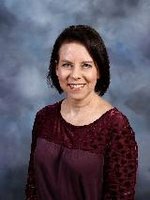 She has taught 4th, 5th and 6th grades, and is now the gifted specialist for Moody Elementary and Moody Middle School. Ms. Harrell lives in Moody with her two daughters, Hannah and Haley. She has two fur babies named Zeus and Molly. Ms. Harrell can be found spending time wither her family, working with the youth at FBC Moody, and, when she has some free time, reading anything and everything she can get her hands on.